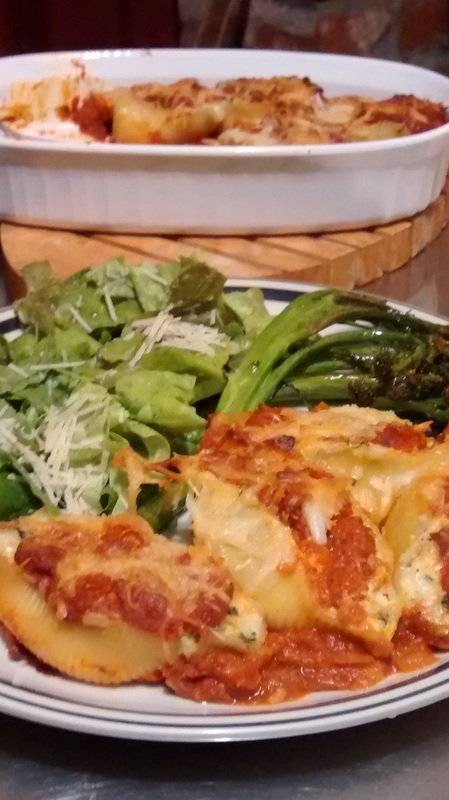 Frozen stuffed pasta shells cook in just over and hour for a fuss-free after-work meal. A few hours time invested will set you up for a dozen ready-to-eat meals. I don't have the time or energy to cook a fresh and wholesome meal every day after work, and most of the ready-prepared food I bring home is too salty or too garlicky or too wrong! Ergo, our newest adventure in food preparation is officially underway: Freezing ready to heat-and-eat portions of our favorite foods. It saves a lot of time preparing meals in large quantity, and you can buy seasonal ingredients on sale and save a bundle. Many foods lend themselves to freezing. Whenever I decide to make something I consider doubling or tripling the recipe to freeze for another day. Want a convenient home-made meal ready to go in an hour or so? Consider investing in a freezer and making your day-to-day dinners a breeze. Read more here. One of the things Mom made that I adored. A big bowl full of crunchy happiness. See the recipe here. Homemade Crackers - Surprisingly Simple and Fun! 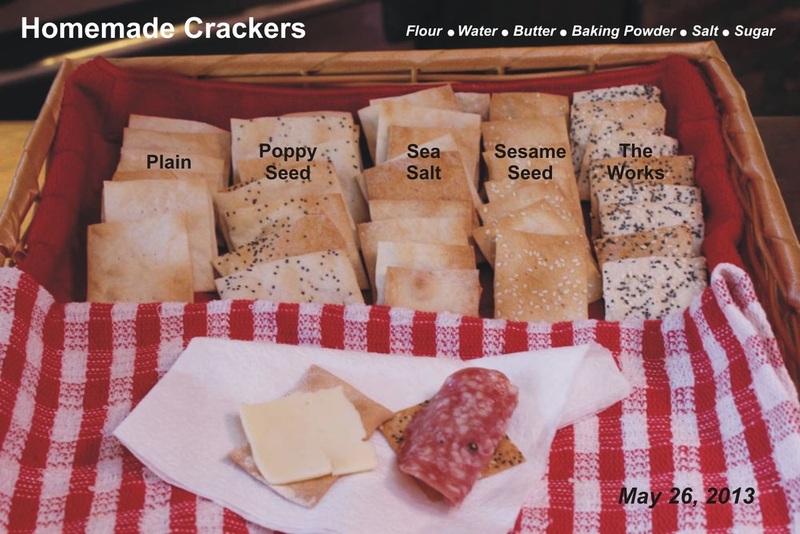 Plain crackers are great alone and can be easily dressed up with seeds and sea salt or anything you can imagine! Making homemade crackers has been on my mind for a long time. Yesterday, for no apparent reason, seemed like the perfect time to give it a try. They were wonderful, easy treats to make and they'll be beautiful alongside the ubiquitous spinach dip at the next party - people can't ever seem to get enough of it. ﻿Click for the easy cracker recipe - and here for the ridiculously good spinach dip. We enjoyed this batch of crackers with extra sharp cheddar cheese, salami, and au naturel. Delightfully crunchy! Begging to be eaten - crispy, tasty woven bacon! I noticed a glaring omission in my blog entries - where is the woven bacon? A question you may well ask yourself after feasting your eyes on these magical squares. Tonight for dinner I had a nice little pork loin and I decided to wrap it in bacon heaven. Sadly, dinner was late because it took a long time to cook, but happily, it was delicious! While I wait for help restoring my original blog entry, here's a link to all it's crispy goodness. LATER NOTE: Blog not lost! There is a teeny, tiny "Previous" link at the bottom of the page that takes you to the older entries. It's not very obvious! After working non-stop in January, my first day off in a month was doubly rewarding with some beautiful fresh eggs - the first gifts ever from our hens. What a wonderful way to start a weekend! moved into the new coop. 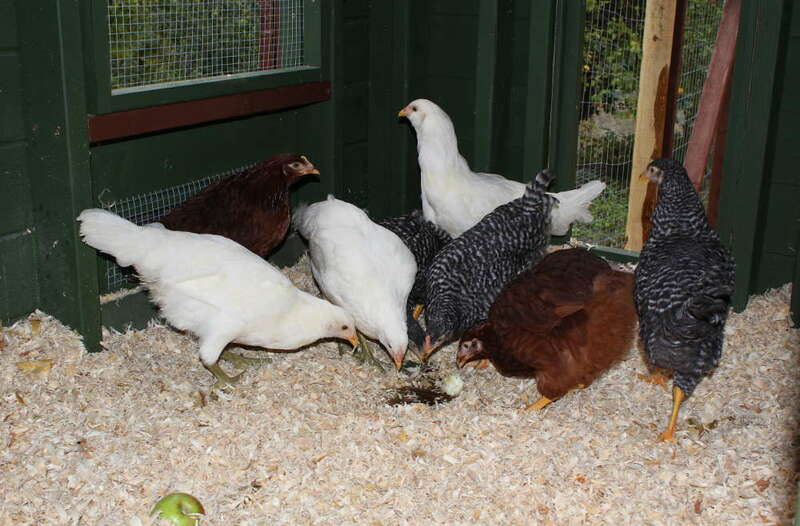 This morning we had our first AMAZING farm-fresh eggs. I can't stop grinning! Click to read more and see pictures of our coop and my first fried egg! With the holidays just around the corner again already, I'm dreaming sweet dreams of treats to come. Rum cake is a year-round tradition in our house and is made for every birthday celebration. Click here for this easy recipe. night - and - day. These two recipes have nothing at all in common except they are both delicious. 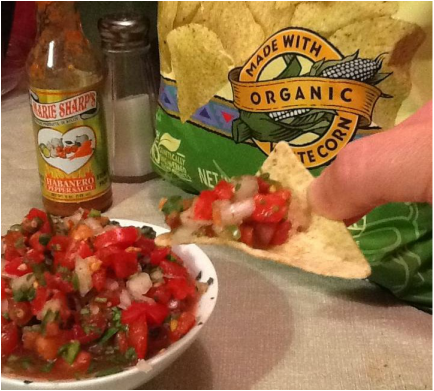 Tomatoes overflowing on the vines, lemons falling from the tree - time to make Pico de Gallo! Fall may be upon us, but my tomato plants are finally bursting with ripe tomatoes, after meager pickings all summer. Steve harvested our home-grown sweet white onions (all 4 of them) and some incredibly small heads of garlic and I decided to make another batch of Pico de Gallo. my grandma's put it all in jars." 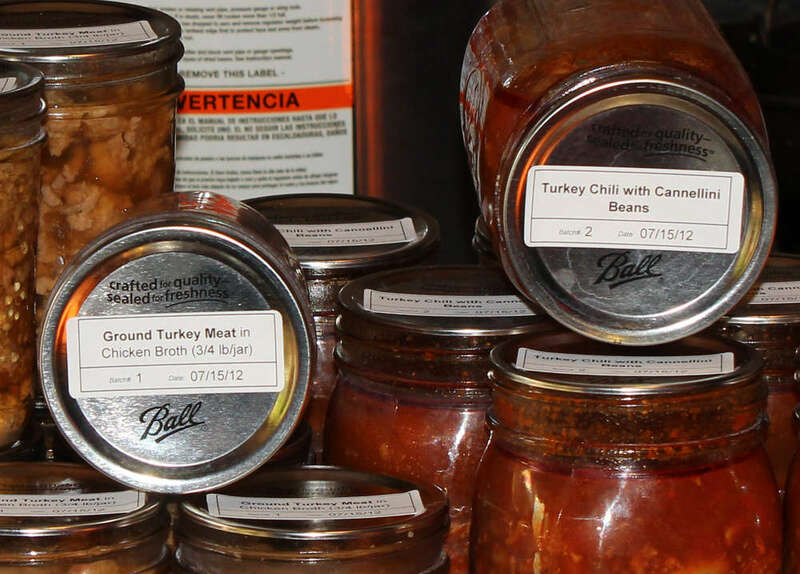 -- Greg Brown "Canned Goods"
Motivation to start canning came in the form of a tasty chili recipe that we can't seem to get enough of. We decided we liked it better than our pantry staple, Dennison's, and that we'd much rather reach for a "can" of ours. Steve and I have talked about canning off and on for years. 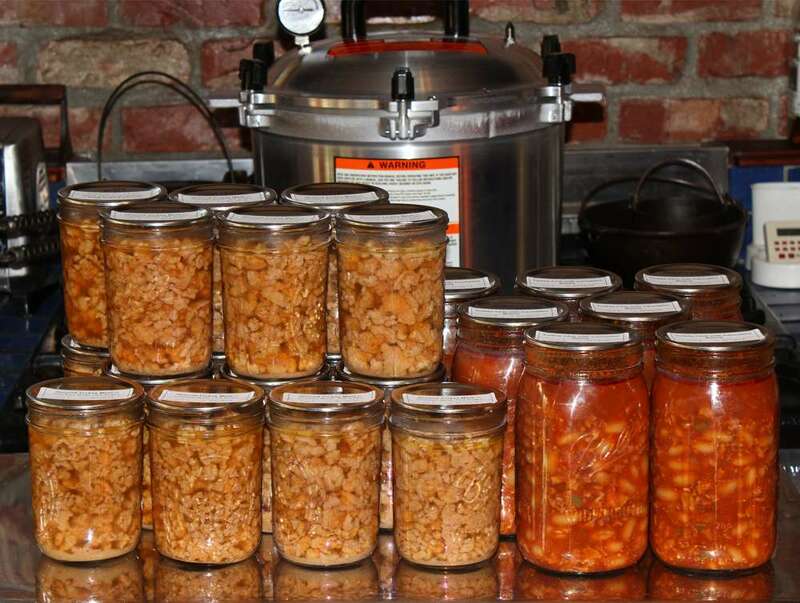 His grandmother canned everything in season, and he grew up watching her toil for days to put up whatever crop ripened next. Her hard work meant their good fortune for the rest of the year. I'm hoping to stock up our larder with a variety of things to make after-work meals healthier and a lot easier. Click here to go to my canning page. Sharing the flyer I put together for a show on Friday I am participating in. After Thanksgiving I was trying to decide what to do with my huge pot of turkey stock. Bunches of fresh rainbow chard begging to be picked inspired me to try Turkey Minestrone Soup (click for recipe). The only difference from my standard recipe was using my turkey stock and 4 cups of chopped leftover turkey (added at the end of cooking) instead of the beef. Surprise! It was great! Any great ideas for left-over turkey? Comments welcome! Well, not new exactly, but new to this site. They can be found in the Recipes Directory. I've posted my two best soup recipes: New England Clam Chowder and Minestrone Soup, crowd-pleasing comfort food as the weather starts to turn cooler. Struggling to eat breakfast? Maybe Oatmeal is the answer for you too. 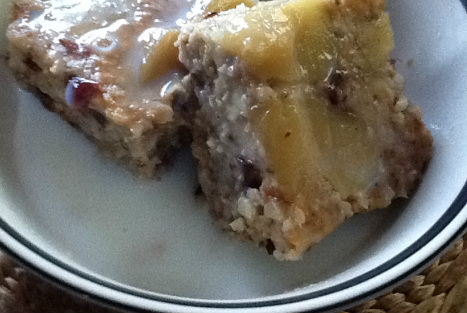 Oatmeal is a nutritional powerhouse and provides energy to keep you going. Try Steel Cut Oats with Almonds and Dried Cranberries for a tasty, crunchy breakfast treat. I have some extra devilish Deviled Eggs which are always a hit and start off with Perfect Hard-Boiled Eggs. Overgrown with summer tomatoes? 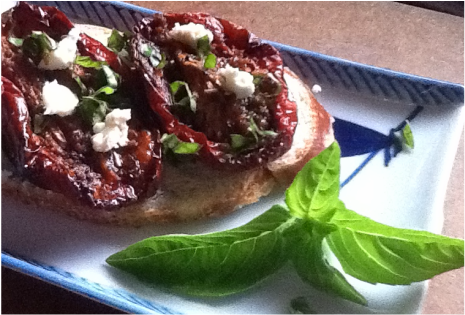 Try these heavenly and versatile Slow Roasted Vine-Ripened Roma Tomatoes - you can eat them as-is or turn them into Roasted Tomato Bruschetta. If you have some abalone sitting around and need a perfect recipe check out Fried Abalone. And since the entire world isn't on a diet, check out my Mom's recipe for perfect Fried Chicken that's a snap to prepare (if you remember to pick up some buttermilk). There's other recipes to check out in the Recipes Directory and more will be coming soon. I've also changed my methods as I don't think the "blog" format is the best choice for me in my goal for an ever-growing food knowledge base, not a one-time recipe. 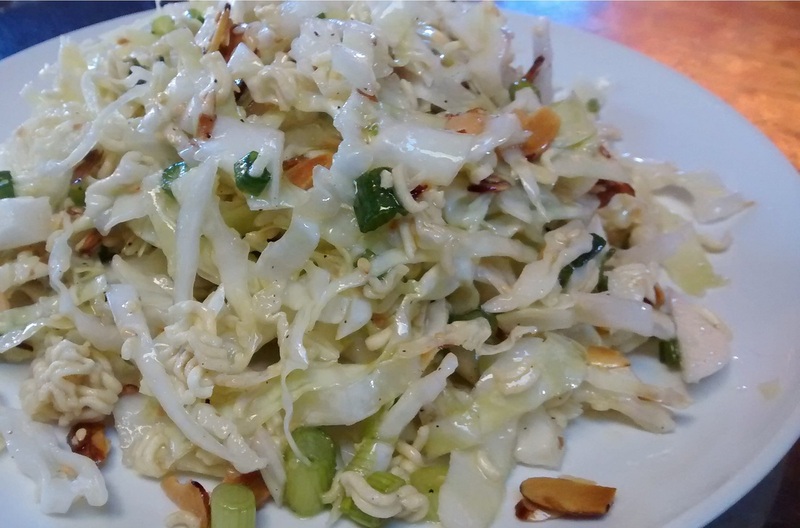 My recipes change as I continue to discover tempting new twists and re-vamp old favorites. Finally! The pie I've been waiting for all year - Peach season is here! Adelle Davis (1904-1974) was an author and nutritionist. Fresh summer fruits star in a meal-sized dessert sure to satisfy your sweet tooth. Lovely for breakfast or brunch or even for dinner! 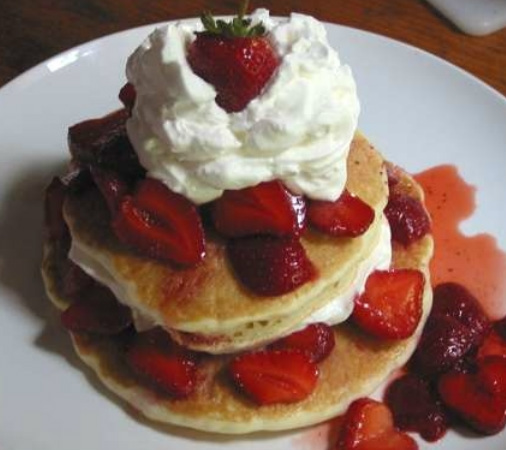 Quick eats with the help of Krusteaz Pancake mix and an aerosol can of real whipped cream. Good items to keep on hand through the summer while fruits are bountiful and delicious. Try any kind of fruits or a combination of your favorites. Aerosol Whipped Cream is surprisingly Light on Points: 1/2 cup is only 2 POINTS PLUS! 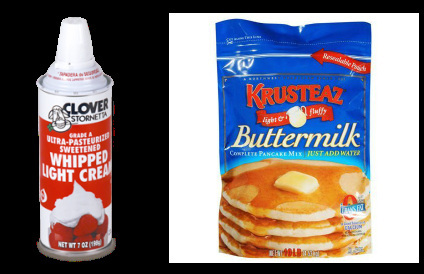 Krusteaz is a pantry staple in our house. 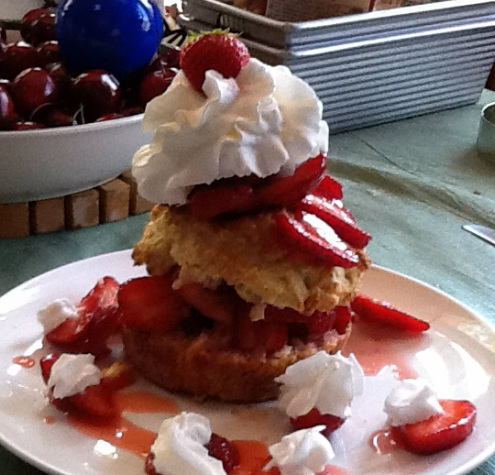 The quintessential summer dessert: Strawberry Shortcake with Chantilly Cream. Homemade shortcake, also 12 Points Plus per serving. 12 Points seems like a bargain for a full-sized serving made with butter, cream and sugar. I love to use nectarines and peaches, and that's next on my list because I just got a box full of ripe fruit. Maybe this is old news, but until 4 days ago I had never heard of woven bacon. WOW! Many lovely meals in our future will showcase this beautiful, crunchy bacon wafer now that it is in my repertoire. For anyone following Weight Watchers - one serving is only 4 Points Plus! That's a bargain for a double layer of crispy perfection to top your next burger or BLT. Bacon on a diet? You betcha! Weight Watchers is more flexible than ever and you CAN eat your favorite foods. The bacon I used makes a perfect square with 12 pieces. I used "platter" bacon which is packaged to order in the butcher department of the grocery store. It is usually uniformly cut and makes for a consistent thickness. Weave the bacon on a COLD pan. Bring slowly up to temperature (350°). Cook it low and slow. This bacon (above) is on our griddle and ready to cook. I only had 11 slices of bacon (1 short) so I cut my slices in half and did 3 small ones. The bacon in the photo above is on a cookie sheet (with sides to catch the grease). This cooked in a pre-heated 350° oven for 45 minutes. Check it frequently and remove when cooked. Drain on paper towels. The large woven bacon square breaks very easily into serving sized squares, which conveniently enough fit perfectly on a standard piece of bread. I really need a vacation! Quick - somebody make me laugh! Hello and welcome! 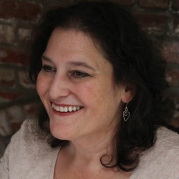 My name is Laura Delanty and I decided it was time to dive into the blogosphere and share some recipes. I hope you enjoy reading it. 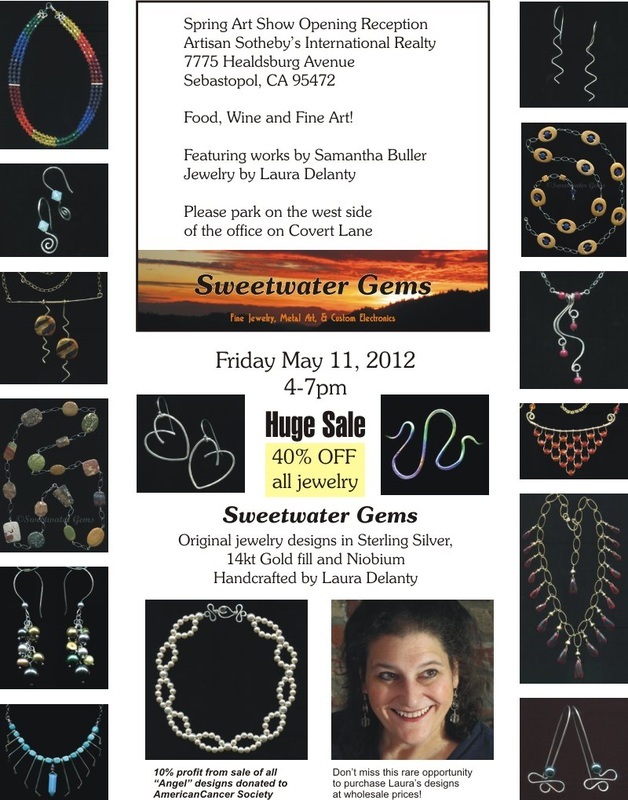 Contact me at SweetwaterGems@gmail.com if you have any questions and please feel free to leave a comment and share your own wisdom!